THE Cub Report, 01.12.2014, Version- The Muad’Dib of RC « Big Squid RC – RC Car and Truck News, Reviews, Videos, and More! There still been no word out of France on any change in condition for Michael Schumacher. For those not into such things, Schumi is the greatest F1 driver of all time who suffered a severe head trauma while skiing. Schumi is an idol of mine so each day I scour the net in search of any change in condition, thus far there has been none. My father ended up dying from a severe head trauma after a car accident, that became one of the biggest reasons why I quit racing full size cars/bikes and starting doing only rc cars. I know what my family and I had to endure when we had to “pull the plug” on my father, no adrenaline rush was worth possibly having to put my family in that position again. Hence the reason I (and lots of other people) choose to pick up a transmitter each weekend instead of going full scale. I really truly wish that Schu’s family isn’t forced to make any hard decisions, I hope he wakes up tomorrow and is 100%, and I hope none of you out there have to go through it either. 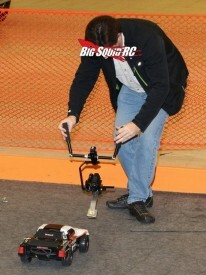 I got an email from an rc manufacturer about a big event SCT event that VRC had put on. VRC is a virtual on-line rc racing biz that I’ve heard numerous industry types say they love, and numerous say they hate. Some love it because it is a form of marketing to them by having their brand included in game, while others hate it because ever moment a person spends on-line playing VRC they aren’t down at their local track using the equipment they sell to keep their doors open. I didn’t use to have an opinion on the matter, but now days I’m leaning towards those that are not fans. There are already too many people sitting behind their computer screens wasting their lives away instead of being out at their local tracks or bash spots getting their trigger on. No, I have absolutely zero data saying “Yes, marketing on VRC helps sell product!”, or “Every big VRC event we lose $$$ in sales”, but I do know I would rather see more people down at the local bash spot. So ya… we’ve got HUGE plans for ’14 and you have probably already seen a difference. In addition to the Monday Cub Report and Thursday’s ASK Cubby, we’ve got our Scale column every Friday, a boat column every weekend, and a quadcopter/heli column on Wednesdays. We are all about rc and are going to do a bunch of quality original content this year. There is a reason we are number one, because we work our asses off, and hopefully that will even be more the case this year. Also of note… Brian should be finished with our latest quadcopter shootout today, our review of the Helion Volition sct will be going up this week, and hopefully we can finish up another review or two for your reading pleasure. Oh ya, and I can’t leave without mentioning… I hear we will be putting on a Quadcopter Event the last weekend in February. More news on that one soon. Our annual Nuremburg show coverage starts in a couple of weeks, and you can come hang with us at the E-Fest show in Champaign Illinois on February 15th. Thanks for reading, have a great week, and support your local hobby shops and bash spots when ya can.